Drug Metabolism and Disposition | BioVision, Inc. The disposition of a drug or xenobiotic (any foreign chemical) within a living organism encompasses all reactions/ physiological mechanisms resulting in Absorption, Distribution, Metabolism and Excretion (ADME) of the molecule. ADME influences the concentration and kinetics of exposure to the tissues and hence determines the effects of a given compound. 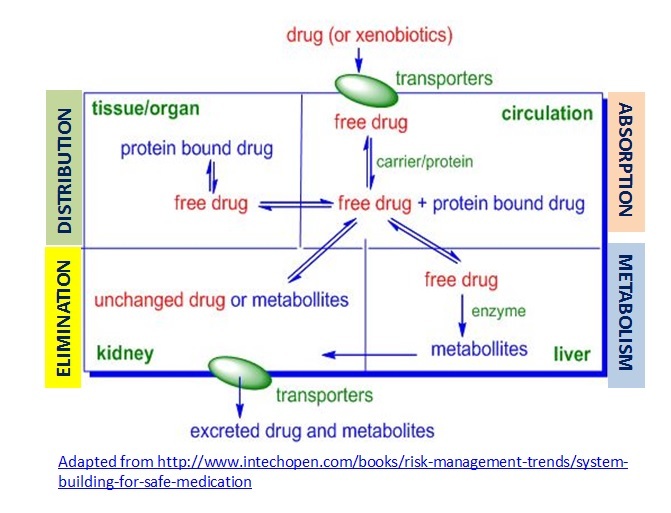 Xenobiotics can be metabolized by various biochemical modifications like oxidation-reduction, hydrolysis, hydration, conjugation, condensation or isomerization, the goal being to make the molecule more hydrophilic and hence easier to excrete. A large repertoire of proteins including Cytochrome P450 enzymes, uptake and efflux transporters (P-glycoprotein, MDR transporters), transferases and many other enzymes work in coordination to breakdown and dispose drugs/foreign chemicals in our body resulting in either the desired effects or toxicity. Here we present a collection of tools (biochemicals, proteins, antibodies, assay kits) to study various aspects of ADME applicable to drug design, drug metabolism/transport, drug-drug interactions, expression/regulation of expression of drug metabolizing enzymes and transporters, structure-function relationship of target proteins, etc.